The newest member of the Little Bigfoot gang! Well, he's not totally new, the smaller version of this pattern has been available since 2012. This larger hippo stands about 10 inches tall from foot to top of ears, scroll down this page for the written pattern. 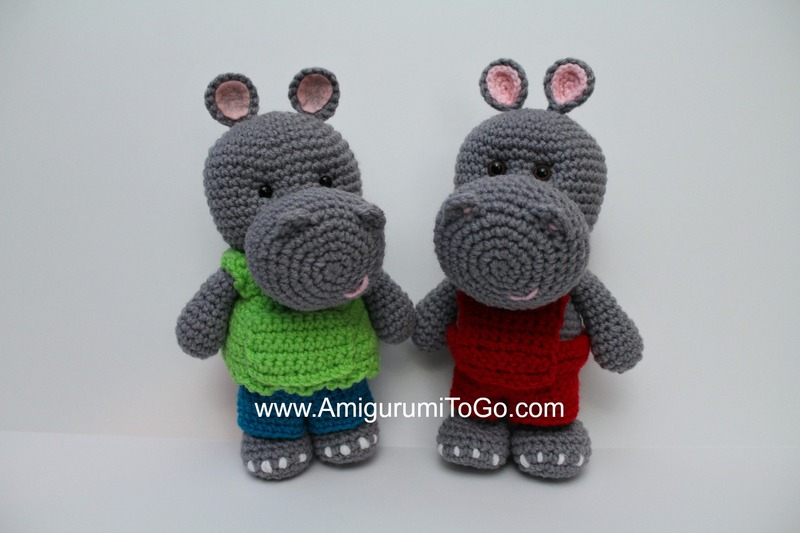 You can dress the larger hippo with overalls or a shirt and pair of pants. For donations of any size please accept this note as my sincere thanks. Of course you can use yarn type of your choice just be sure to choose the appropriate hook size. 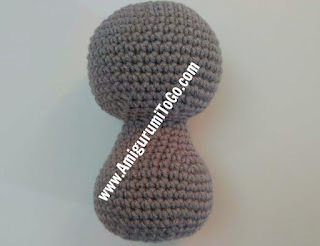 Eyes: you can use buttons, felt, paint, safety eyes or crochet them. It's up to you. For the hippos pictured I used an 8mm and 10mm. Now is the time to put in the safety eyes if you're using them. Placements are up to you since it's personal preference. 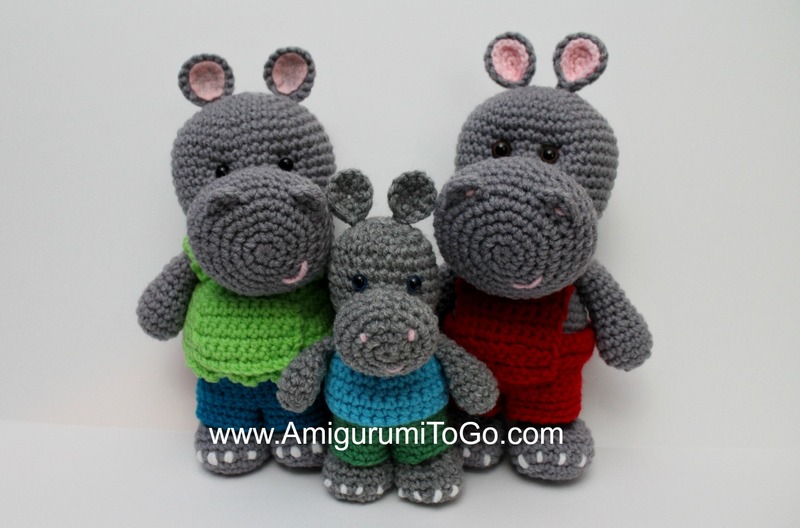 I put this Hippo's eyes in between the 10th and 11th row with 4 visible stitch holes between them. Do not put them lower than that as you need room for the muzzle. Stuff majority of head. Push the stuffing to the top of the head then make sure to gt stuffing all around the sides of the face and neck area. Shape as you stuff. It will take lots of stuffing. You will stuff more in a few more rows. Stuff the majority of the body.. make sure to fill in any gaps in the neck area. You will stuff more over the next 2 rows. Stuff more as needed, be sure to get all around the bottom of the belly. The belly should be nice and fat. f/o leaving a tail for closing up the gap. Weave in and out of the remaining stitches. Add more stuffing as needed. Push it all round the bottom of the belly. Pull yarn tail tight to close gap. Knot off and hide yarn tail in the body. Nostrils: Insert yarn in between the 6th and 7th row, ch1, put 2hdc in the next 2 spaces, sl st next space then f/o. There's 4 visible stitch holes between nostrils. I added a bit of pink inside each nostril by pulling pink yarn through and knotting it off on the inside of the muzzle. 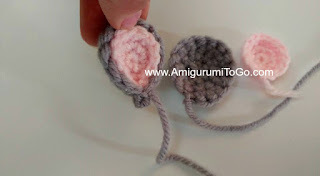 If you troubles inserting the yarn and adding nostrils this way, I have another pattern with a video that shows how to do this. Click here to view video. It's for a dragon pattern of mine. The nostrils are much bigger on the dragon because I use dc but you'll get the idea of what to do by watching that. You can add a mouth now too. I pulled pink yarn in between the 4th and 5th row and knotted the ends off on the inside of the muzzle. I put it off center. Of course you can do any style mouth you want. Stuff hand after 1 or 2 rows. Lightly stuff arm when you're done leaving the last 2 or 3 rows unstuffed. If you want a hippo that sits then leave the last 3 rows of the legs unstuffed and then continue onto row 16. If you want a hippo that is in a permanent standing position, then stuff the entire leg and f/o now leaving a long tail for sewing. f/o, pull tight when you f/o then cut up shorter, about 1/4 inch or so, then fray the ends. If you want to, weave one of the starting yarn tails through the tail and cut the same length as the other and fray it as well. The ASSEMBLY section is on a separate post. Please click here for assembly instructions. Will there be a YouTube video for this little guy?.